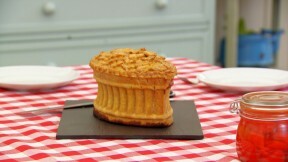 This raised game pie recipe is Paul's interpretation of the signature challenge in the Victorian episode of Season 3 of The Great British Baking Show. It is explained in further detail by Paul in Masterclass: Part 3. Preheat the oven to 375F. Grease a 8in spring-form cake tin, about 2¾in deep, with lard. First make the filling. In a large bowl, mix the shallots and garlic. Add the game, pork belly mince, diced bacon, Madeira, spices and herbs. Season with salt and a little white pepper. Using your hands, mix all the ingredients thoroughly together. Put in the fridge while you prepare the pastry. For the hot water crust pastry, combine the flours in a bowl, add the butter and rub in lightly with your fingertips. Heat 7fl oz of water, the salt and lard in a saucepan until just boiling. Pour the mixture onto the flour and mix together with a spoon. Once cool enough to handle, tip onto a floured surface and knead into a smooth dough. Work as quickly as you can now (as the pastry will become more crumbly as it cools). Cut off two-thirds of the pastry, roll it out and use to line the prepared tin, leaving any excess hanging over the side. Check there are no cracks or holes in the pastry. Roll out the remaining pastry for the lid and leave to one side. Stand the tin on a baking tray and bake the pie for 30 minutes. Turn the oven down to 325F and bake for a further 1¾ hours. Leave the pie to cool completely in the tin before removing. Slice on a plate to catch any juices. Serve at room temperature.